Party guests have access to all games and activities in our showroom including swingsets, trampolines, & basketball goals. Your party comes with tablecloths, napkins, plates, and silverware in standard primary colored party theme. Just bring a cake, some drinks and maybe order a pizza, we’ve got the rest. Parties are priced for up to 18 children. Q. How long are birthday parties? All birthday parties run for 2 hours. You can extend either the 5pm and 6pm parties by 1 hour for an additional $100. Only those party times may be extended, and extended parties requires notice at the time of booking. To book a 3 hour 5pm-8pm or 6pm-9pm party, please call us to make your booking. 410-992-0992. Q. How many kids may I have at the party? All parties are priced for up to 18 children. We count children that are between 12 months and 14 years old. Adults are not counted into your total. We can accommodate a maximum of 20 children at any party and charge an additional $8 per child for the 19th and 20th child. Please do not invite more than 20 children to the party as that is our maximum. Q. Is there any way to have a party for more than 20 children? The only way to have a party for more than 20 children is to book both rooms at the same time. You would need to book the 5pm AND 6pm time slots on the same day and run your party from 6pm to 8pm. The cost of this would be $638 plus tax on the weekdays and $738 plus tax on the weekends. The party still runs for 2 hours, but both rooms would be yours allowing 36 children (4 more children may be added for $8 per child). This party can be extended by 1 hour to run from 6pm to 9pm for an additional $200. The two party rooms are not adjoined. To book a double-room party, check the party calendar above to make sure both the 5pm and 6pm slots are available on the date you are looking for and call 410-992-0992. We do book up fast! Generally we are booked out about 2-3 months ahead of time, so if you see a party day that works for you, grab it quickly. Q. What is included with the party? We supply paper plates, napkins, plasticware, cups and tablecloths. See the 360 degree image on this page to see an example of the color scheme and supplies provided in the party room. Each party room has a full size refrigerator and freezer. Each party room has 2 8′ long tables to eat on and 1 6′ long table to serve on. Outside each party room is a table for gifts. Up to 20 chairs are available for each party room. A party coordinator will assist you set-up your party and be there to answer questions. Food and drink are not provided but may be brought in. Most people order pizza and bring in a cake. Q. Where is there to order pizza from? You are welcome to order from anywhere or bring in food, but we recommend Romas. They cater most of Play N’ Learn’s parties and are reliable and good! Q. Is there a discount if my party will not have 18 children? All parties require the same resources whether there are 6 children or 18. There is no discount for parties with less than 18 children. Q. What can I expect from my party coordinator? Your party coordinator is there to assist with set up and clean up of your party and to answer any questions. Forgot a lighter for the candles or knife for cake? Your party coordinator has one! He/She is not permitted to serve food or supervise guests, but will be sure your supplies are replenished and your trash is emptied as needed. Your coordinator is permitted to accept tips. Q. May we have a party by buying a bunch of weekend play tickets? No. 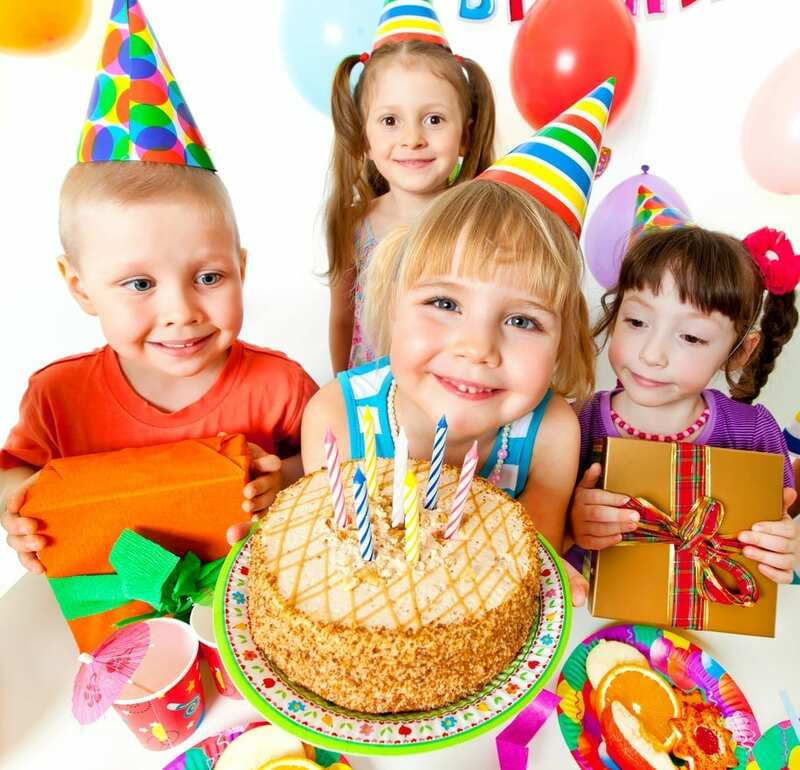 While we would love to host your child’s birthday party, all parties MUST be booked properly. No food or drink is allowed outside of the party rooms. All unauthorized birthday parties will be asked to leave in fairness to those that properly booked. Q. Do you offer invitations? Q. What is the deposit required to book? Payment in full is required to book any party. No party can be held without payment. Parties are 100% refundable if your party is cancelled 14 or more days before your party. Parties are refundable for 100% store credit if your party is cancelled within 3-13 days of your party. Parties are refunded with 50% store credit is your party is cancelled within 3 days of the party. Q. May we decorate our party room? Yes, you are welcome to bring your own themed tablecloths, happy birthday banners, etc. If it hangs with scotch tape, we’re cool with it. Please do not bring glitter or anything that may damage the merchandise or party room. Q. May we bring pinatas? Q. May we bring in characters? Yes, we have had Mickey Mouse, Optimus Prime, and every Character from Frozen. Characters are welcome. We simply ask that you tag us when you post the pics on Facebook! Q. May we bring in a face painter? Yes, face painters are okay with us as long as they do it on the tiled area in or right outside your party room, but please, no glitter. Q. Will there be others in the playground during my party? Yes, please expect that there will be families in the playground to shop, to play, and potentially at another birthday party while your party is going on. If you want a quieter party, book the 5pm or 6pm parties. The stores close at 5pm on Saturdays and 4pm on Sundays so there will be no people in to shop or play after those times. For a completely private party book the 5pm AND 6pm parties and run your party from 6-8pm. Q. What if it snows? If Play N’ Learn closes due to inclement weather we will work with you to select another available party time or you can opt to receive a full refund. Q. May my guests stay and play after my party is over? Sorry, we host a lot of parties on the weekends and need to keep the parties moving so the showroom stays safe and does not get overcrowded. All party guests must leave when the party ends. Q. When should I arrive for my child’s party? Hosts can and should arrive 30 minutes prior to the party. Come in empty handed, there will be a shopping cart waiting right inside the door for you. You are welcome to use that to take to your car and wheel in your cake, supplies, etc. Your party room is not available greater than 30 minutes before your party so don’t arrive too early – a half hour is perfect. Q. Does the birthday child count towards the 18 children? Q. Is there a wait list available for cancellations? No, sorry. We very rarely have a cancellation. If we do however, the online calendar will be updated immediately.